Warning: this week's episode contains underage drinking and quite a bit of violence, and this recap contains quite a few spoilers. Without further ado, let's get down to business. While "Pieces of a Broken Mirror" contains several storylines, several of these are bound up together, making this episode a little harder to divide up. Because of that, I'm sticking to two longer plots. Plot B will revolve around the Sirens and Ivy. Plot A will revolve around . . . everyone else. The episode opens with Gordon entering a whorehouse—not to shut it down or get laid, but because he's looking for Bullock. After finding out from the owner that Bullock stopped by recently, Gordon leaves a message for him. In a nearby diner, one of the local men asks the waitress about the new customer. She says not to give him a hard time. And who is this new customer? None other than Alfred Pennyworth. The man asks if he's from around. Alfred doesn't give him a straight answer and simply tips the waitress before leaving. In a building close by, Lee explains to a group of Narrows citizens that they can't keep stealing from each other. When they insist that they're only trying to survive, she points out that their enemy is not each other, but the city. Fighting and stealing from each other just increases the likelihood of their own destruction. As she speaks, a man at the back of the room, hidden from view, sets up a toy plane. Elsewhere, Alfred gets stopped by the man from the diner and his friends, who try to rob him. Alfred gets the drop on them quickly before Gordon shows up and tells the men to leave. He then asks Alfred what he's doing in this part of town. The answer? Living there. Meanwhile, Lee says tells the crowd that she wants a chance to transform the Narrows into a place where you don't have to steal from your neighbors to survive. Her audience begins to applaud, including Nygma, who looks proud of her. But before Lee can explain how she's going to change the sit, the toy plane rushes forward. Grundy swipes it out of the way. The plane then hits a wall and explodes. Gordon and Alfred see the smoke and help rush people out of the building. As they do so, they miss the sight of Lee, Nygma, and Grundy getting into a car—as well as a certain young woman exiting a nearby building (more on that later). After clearing the building, Gordon sets up a perimeter. Lucius Fox arrives to help investigate. Given the situation, Gordon tells Alfred that they'll talk later. Once he leaves, Gordon begins to question the people of the Narrows about the purpose of the meeting, but they won't tell him anything. Lucius examines the plane and notes that not only is it covered in explosives, but it's an expert design. He theorizes that one reason for using such a specific device would be to target a specific person, rather than the whole crowd. Over in the Narrows, Nygma insists that the bomb was planted by someone from the Narrows and says they should just burn the place to the ground. Lee doesn't agree and walks off, leaving Nygma to yell about how he'll sic Grundy on the culprit. Grundy, however, looks thoughtfully off into the distance. As he does so, memories of Penguin slicing off his hand and Barbara shooting him flash in his mind. Looks like Butch is back. Back at the diner, Alfred is applauded for helping rescue people from the fire caused by the explosion. The waitress, Tiffany, gives him a glass of their finest alcohol, and the man who tried to rob him even shakes his hand and makes amends. As Alfred shares a drink with the two of them, he notices a bruise on Tiffany's forehead. She tries to brush it off as an accidental injury, but Alfred doesn't seem to buy it. Elsewhere, Lucius and Gordon enter the only business in the store that both manufactures and sells hand-crafted toys. A young man greets them, and they ask about the plane. He replies that while they do sell that kind of plane, the one Gordon and Lucius have has been modified. When they ask him how many people work at the store, he replies that it's just him and his father, who is upstairs. Gordon tells the man to get his father (aka the Toymaker). However, not long after the man leaves, Gordon and Fox have to dodge machine gun fire from a giant, modified nutcracker that suddenly begins to shoot at them. Gordon manages to gun it down, and he and Lucius quickly run out of the store. The son stops them just as the father drives off, begging them not to go after him. Before the conversation can go further, Tiffany's boyfriend shows up, seemingly unworried about the fact that he left her to walk home alone in Gotham, but slightly annoyed at the presence of Alfred. Alfred suddenly attacks him, yelling about the bruise he saw on Tiffany's forehead and telling him to drop the nice guy act. In the ensuing scuffle, a ring slides off Alfred's hand, which the boyfriend surreptitiously pockets. Tiffany tells Alfred to stop and says she'll be fine. She drives off with the boyfriend, who says she really needs to be a little smarter. After they leave, Alfred kicks a garbage can in frustration. Meanwhile, Gordon meets with Barbara to ask her if she knows anything about the Doc. Since he assumes it's a he, Barbara decides to play up the secret and pretends as if "the Doc" is a dangerous character he should shoot first and question later. She tells Gordon that he can find the Doc working with Ed Nygma in the Narrows but warns him that he might not like what he finds. Gordon later receives a call from Harper about a murder in the Narrows. The victim? Tiffany. The suspect? Alfred Pennyworth. The boyfriend claims he was working all night and that Alfred had assaulted him earlier. Tiffany, who was beaten to death, has impressions on her face left by a signet ring that belonged to Alfred. Gordon then heads over to the Narrows, where he watches Nygma give a speech to hype up the Doc, hailing her as a leader who fights for the people and can't be killed. After he finishes his spiel and exits, Lee steps on stage, only to see Gordon right away. Lee then addresses the crowd. She says that whoever tried to kill her, whether it was an insider or an outsider, was afraid of a united Narrows. Why? Because a united Narrows is a strong Narrows. While Gordon seems somewhat conflicted about what he's hearing, Nygma has a very clear opinion of Lee's speech. Gordon says he should arrest Nygma, but Nygma says that he's really trying to help Lee. Gordon tells him about the toymaker/assassin who tried to kill Lee, to which Nygma responds, "That is so Gotham." After the speech is over, Lee approaches Gordon, who asks her how long she's been back in Gotham. She says it's been a while, but she's been busy. After a bit of awkward tension, he tells her about the Toymaker trying to kill her, and about how both he and his employer are still at large. Lee shrugs it off, saying that no one is ever really safe in Gotham. After Lee leaves, Gordon decides to take a look around. Nygma, however, spots a man with a gun at the back of the room and follows him. The man (the Toymaker himself) grabs Nygma and drags him out into the alleyway, only to tell Nygma that he's been looking for him. Meanwhile, Alfred goes to a bar where Gil is hanging out and begins to beat him up. Unfortunately, Gil's friends outnumber Alfred, and it almost looks like he's done for. Almost. Harvey Bullock is the hero we all deserve. After taking down Gil and co., he explains to Alfred that he works at the bar because it involves his two main passions: drinking and ignoring people. Alfred then explains that Gil is a murderer, and Harvey calls the cops. Back at the fight club, Nygma argues with the Toymaker, which leads to a shocking revelation. I can honestly say I didn't see this coming. I just assumed Sofia hired the Toymaker. It seemed like her style; hire one of Gotham's freaks to do her dirty work so she could get control of the Narrows. But I was wrong. Instead, Ed's alter ego has been sneaking behind his back again. It's like in season 2, when he woke up and realized his other self hid Kristen Kringle's corpse while he thought he was sleeping. This time, the Riddler hired the Toymaker to kill Lee. The Toymaker explains that Nygma wanted to get rid of Lee because she was holding him back. Before Nygma can respond, Gordon sees the Toymaker and, thinking he's threatening Nygma, shoots him down. Gordon then asks if the Toymaker said anything about who hired him. Nygma frantically tells Gordon that Toymaker confessed that it was all his own plan, because he didn't like what Lee was doing in the Narrows. As Gordon takes the Toymaker away, Nygma's reflection continues to taunt him. 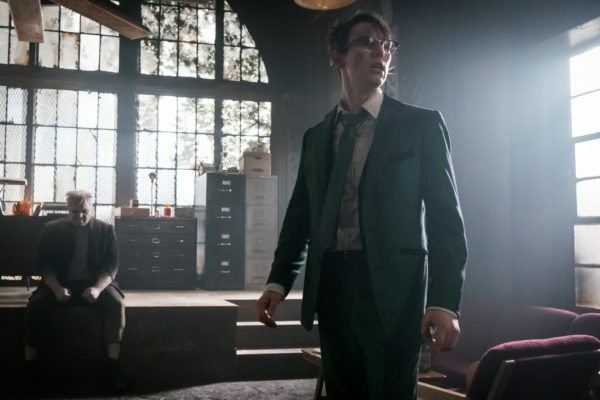 While I understand that some Batman fans might be frustrated that Nygma got the split personality storyline in Gotham instead of Harvey Dent (who has been conspicuously absent for two seasons), episodes like this one prove that it was a good creative choice. While most versions of Two-Face show Harvey's sides as equal partners who are willing to let the coin arbitrarily make decisions, Ngyma's other half (let's call him the Riddler) doesn't play fair. The Riddler goes behind Nygma's back in a manner befitting Edward Hyde. Nygma is a character who thrives off of being in control, and his alternate self is a constant threat to control, a threat that he can never fully defeat. This version of the Riddler is tragic because his biggest enemy is, more often than not, himself. Nygma has a tendency to cut down the people closest to him, and it looks like the Riddler just decided Lee's next on the list. A group of Narrows teenagers enters an abandoned store that belonged to the potions salesman from episode 2. They're looking for drugs, but instead find that the store has been overrun by vines and weeds. In the center of the room is a sort of gelatinous pod with someone inside. After one of the kids gently nudges it, the person begins to stretch out, breaking the surface of the bubble. Lo and behold, it's the new and improved Ivy Pepper, now played by Peyton List (whom you may recognize as Lisa Snart from The Flash). After Ivy emerges, one of the teenagers tries to hit on her and she grabs his wrist, which results in a display of newfound power. Later, after the explosion in the Narrows, Ivy exits the building. As she walks down the streets, she laments the fate of dilapidated plants on the side of the road, saying that the city is killing them. Ivy then notices a rich couple leave their apartment and get into a taxi, suitcases in tow. Once they drive off, she walks into their home and takes a look around. After putting on a fancy gown from the wife's closet, she does what anyone would do after being reborn: she settles onto the couch with a carton of ice cream and starts channel surfing. After quickly skipping past a few news bulletins about environmental disasters, Ivy stops on an ad for the newly re-opened Sirens Club. The ad itself was released early as a promo video and can be seen below, in all of its ridiculous glory. As Ivy watches the commercial, she begins to recognize Selina and Tabitha—and remember that she's not so fond of the latter. Over at the GCPD, Lucius and the medical examiner examine the body of the kid Ivy killed, which they found after the explosion. The ME explains that the victim was killed by poison but notes that there's actually poison ivy growing inside him and living off of his tissue. Over at the Sirens Club, Barbara happily remarks that the commercial worked, as business is booming. When Ivy shows up in another stolen gown, Selina wonders who she is. Of course, she doesn't have much time to wonder, as Barbara tells her that she needs to tell a group of teenagers to quiet down. The crew is, of course, led by Bruce Wayne. Bruce tries to tell Selina to relax and have a drink, but she tells him to dial it back or she'll call Alfred. When he tells her he fired Alfred, she asks what he's trying to prove and doesn't seem to buy the whole billionaire brat act. Before the conversation can go any further, Selina gets distracted by a nearby brawl. It turns out two guys are fighting over Ivy, who claims to have no idea what got into them. Tabitha (unaware who she's talking to), tells her to leave. When Ivy remarks that Tabitha was always rude, it begins to dawn on her that it's Ivy. After the club is closed, Butch arrives and reveals to Tabitha that he's begin to remember. He admits that while he's not sure how he became Grundy, the only thing he knows for sure is that he loves her. When she doesn't respond, he leaves. Later on, Selina follows Ivy back to her apartment, only to be found. Ivy then begins to infect Selina and explains that the poison infecting her veins is Ivy's essence. Before the poison can kill Selina, Ivy gives her an antidote she developed (presumably after experimentation on other subjects). She explains that Selina needs to trust her. When Selina calls her crazy, Ivy insists that she's been transformed for the better. Pretty sure Sofia's already done that to both Gotham and Gordon, but sure. Give it your best shot, Ivy. Plot A: While I'm sometimes annoyed by Gotham's tendency to shove several storylines into a single episode, this wasn't one of those times. "Pieces of a Broken Mirror" works because Alfred, Gordon, Lee, and Nygma's stories all affect one another. No one exists in a vacuum. Gordon's search for Bullock takes him to the Narrows, which makes him run into Alfred. The Toymaker's assassination attempt causes a fire, which they rush to rescue people from. This leads to Alfred getting closer to Tiffany and finding out about her abusive boyfriend, as well as Gordon finding out about Lee's role in the Narrows. All of these events interact in ways that can't be separated (hence my tendency to lump them all together). The funny thing is, by the end of the episode, Gordon gets exactly what he wanted in the first place: he finds Bullock, who was the only reason he came to the Narrows in the first place. That brings me to the Narrows. AV Club's review noted that season 4 of Gotham has been diligently fleshing out the city, and I'd have to agree. The Narrows are a microcosm for all of Gotham, showing the hope for a new day amidst the devastation caused by crime and corruption. And every character that lives there has a reason to stay, especially Lee. This season has renewed my faith in her character, mainly because it's focused on her capacity to display empathy—not just towards the people of the Narrows, but for Nygma as well. Plot A was, in a word, brilliant. Plot B: While not quite as intricate as plot A, this storyline was still intriguing. It has been a little odd to see three different actresses portray Ivy Pepper, but I've genuinely liked each of them. Peyton List is no exception. In fact, she might be one of my favorite portrayals of Poison Ivy so far. I like how she doesn't waste time with seduction or cheesy banter; she just takes what she wants and makes fertilizer out of anyone who doesn't listen. It makes sense that her character would react this way. After being put down for so long, she's finally got her own power. Not just hypnotic perfume or the power of being at Penguin's side, but actual, physical power within her. Of course she wouldn't be shy about using it. And the scene where she almost killed Selina, only to slip her an antidote? That was a major power play. While Ivy might claim to have her friend's best interests at heart, she absolutely wants Selina to know that she's the one in control. Overall, I'd say that "Pieces of a Broken Mirror" was a great way to jump back into the world of Gotham. I would've liked a little more Bruce, but adding him into the mix for more than that one scene would've made the episode too crowded. Besides, the next episode looks like it's going to be a big one for him. That's right, ladies and gentlemen. After nearly four years of waiting, we're actually going to see bats on that show. Are they real? No. Are they anatomically accurate? No. But the fact still remains: WE'RE ACTUALLY GETTING BATS. I, for one, am excited. Come back soon for my recap of episode 13, "Beautiful Darkness." Until then, stay safe and avoid nutcrackers with machine guns.